can aid the positive impact of migration on home countries. continue to grow by 3.5% to $459 billion by 2018.
drive growth of inclusive finance. are hampered by high costs which impact the efficient flow of remittances. transfer operators) are lower at around 6%, with post offices’ being 7%. 2030). A 5% decline in remittance costs could generate $15 billion in savings. Information and communication technologies could play a key role in this area. infrastructure according to the report. full taxes on previously unreported revenues. the proper means, or they find it uneconomical, inconvenient, or both. chain, while others want to reconfigure it in a more fundamental fashion. classifies Fintech propositions based on scale and scope of impact. doing net transfers across their international accounts. 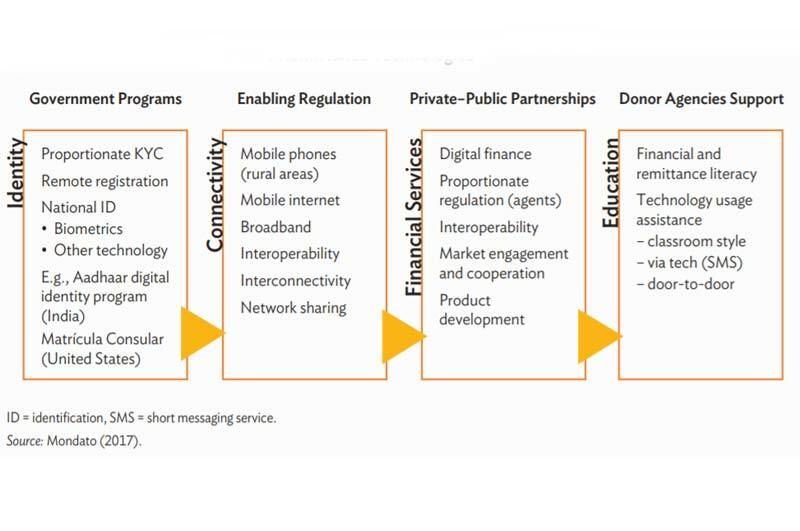 disintermediation and open APIs to make for more democratic access. could theoretically render intermediary banking infrastructure unnecessary. structural impact of the technology. remittances and driving greater financial inclusion. the Mexican Matrícula Consular in the US. access to digital remittance channels. through public-private partnerships and with possible donor agency support. Development Impact of Migration through Finance and Technology’ here. The section on &apos;Leveraging Remittance Technologies for Financial Inclusion in Asia&apos; is available here.